A wire recorder can prove to be one of the poignant objects relating to the wars of mankind, by virtue of its historicity. In that regard, back in 1946, the late David Boder (1886-1961), a professor of psychology at the Illinois Institute of Technology, traveled to Europe and started his incredible endeavor of interviewing over 130 Jewish holocaust survivors. The interview project was conducted in over nine languages at various refugee camps spread across France, Switzerland, Italy and Germany. Some of the recordings were also complemented by German and Yiddish songs (and religious services) sung by the survivors. And now after decades, the wire recorder in question has been once again repaired (quite fortuitously), thus providing historians access to the authentic songs. Boder’s recordings amounted to over 200 spools of steel wire, based on the magnetic technology that was quite novel during the 1940s. And while most of these were archived in 1967 at the Drs. Nicholas and Dorothy Cummings Center for the History of Psychology at The University of Akron (UA), in Ohio, the audio evidence of the Holocaust victim songs was seemingly forgotten over the decades – presumably thought to be lost. That is until a recent endeavor was formulated that sought to digitize many of the recordings stored at the center. 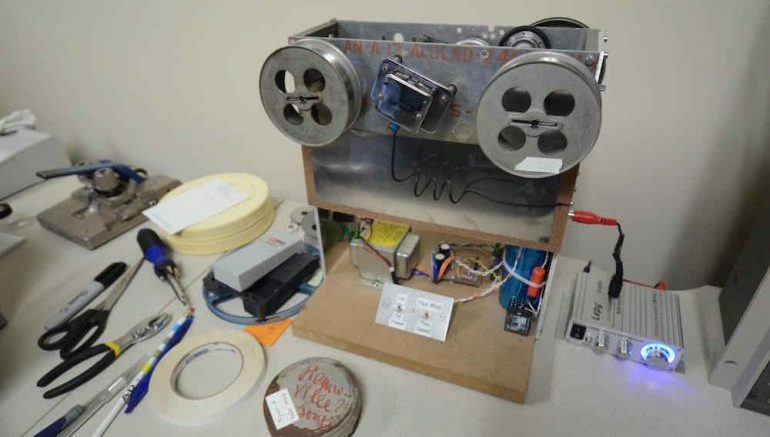 Researchers then re-discovered a spool with the Yiddish and German “Henonville Songs”, with the wire being mistakenly housed inside a mislabeled canister. I think it is one of the most important discoveries from our collections in our 50-year history. The songs were recorded at a refugee camp in Henonville, France. The Nazis made the prisoners sing some of these songs as they ran to their forced-labor sites and back each day. That we could give the world the melody to a song sung by those sentenced to their death through forced labor during one of the most unspeakable horrors of the 20th century is remarkable. Unfortunately at the time, in spite of finding out the spool, the researchers were still not able to play the recordings because of the incompatibility of the wire recorders available at the facility. But ‘cometh the hour, cometh the online retail service’; it was eBay that oddly came to the rescue, when Litsa Varonis, an instructional designer at UA, found the right model of wire-recorder after a year-long search through online domains. She conscientiously donated her find to Cummings Center, while her husband, Orestes Varonis, further collaborated with the Instructional Services department to redesign and modify the recorder, so that it could work in sync with the authentic recordings. There was a lot of time spent on research and experimentation. The recorder no longer uses vacuum tubes or rubber tires, and is mostly built from new parts. It has a simpler, and more accurate, drive mechanism. It felt like I was helping in some way to bring these voices to the present, voices that had become somewhat lost to the historical record. The discovery of this single canister holding a lost recording means that these songs can be heard again, they can be studied and they can inform us in a new way about the experiences, the joys and the frustrations of these displaced persons. These songs, in the voices of those subjected to unspeakable cruelty, are a reminder of the power of memory, the value of history and the indomitable human spirit. Hearing them sing again after 70 years of silence gives the world a greater understanding of the circumstances and experiences of those who were witnesses to a dark chapter in human history.